range of colors for your podcast player, to better match with the look and feel of your website. available. 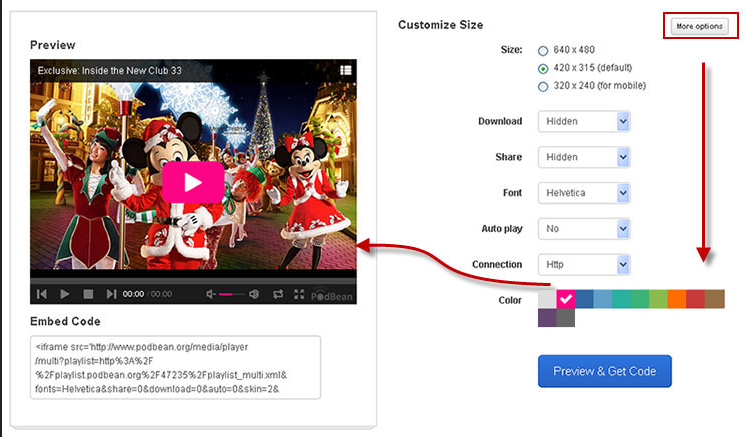 Choose the color you desire and click “Preview & Get Code” for the corresponding coding to paste in to your site. on site”, you will see the range of colors. Click on the desired color and “save” to make the change on your site. support@podbean.com and we hope you enjoy this new option. Podcasters occasionally wish to view detailed information about their episode plays. For example, you may see something that seems unusual, such as a big increase or decrease in plays for a particular episode, and want to more closely analyze the data. With Podbean’s latest statistics upgrade, Business Plan users* now have this data right at their fingertips. In your dashboard, go to Statistics->Trending and scroll down to “Episode Plays”. On the right side, you will see a button, “Export Full Data”; click to choose the month you desire (from the last three months) and the data will be exported to an Excel file. You can now see the details (file, country, IP, client/platform) of each episode play. Podbean’s enhanced statistics help your podcast succeed and grow! W e welcome your feedback and questions at support@podbean.com. *Full data export feature is only available for Business and Enterprise plans. To view plans/upgrade, visit http://www.podbean.com/podcast-hosting-pricing. along with a full length sidebar for all your widgets. site look great with ease!